The Special One was invited to do the ceremonial puck drop before the game and learned the hard way just how slippery ice can be. 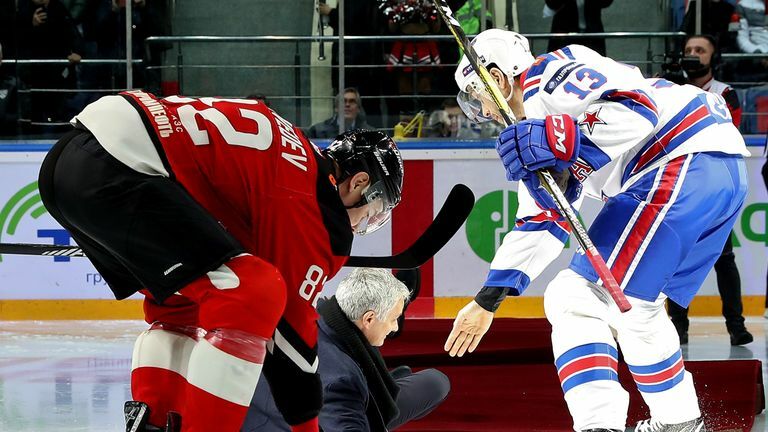 Mourinho was guest of honour at a Kontinental Hockey League (KHL) match between SKA and Avangard in Russian Federation. However, upon seeing Datsyuk reaching out for a handshake, Mourinho reached back to oblige, only for the carpet to roll up and the manager to take a rough spill to the ice. It is not the first time Mourinho has hit the ground at a public event - he tripped over outside England's match against Spain at Wembley last September when attempting to step across a rope barrier. Over the weekend he visited posh Knightsbridge restaurant Harry's Dolce Vita to toast his son Jose Mario's 19th birthday.